Roll the dice in a mystical world filled with exploration, puzzle-solving, and adventure! 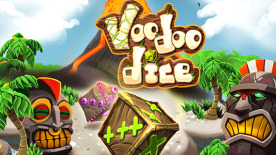 Mixing action based and puzzle mechanics in a 3D world, Voodoo Dice is an innovative, challenging puzzler that plays with your mind to lead you to solve puzzles in unique and interesting ways. Encounter a funny and original universe, with great style and vibe, travel between different maps, defeat your enemies and solve enigmas. Be prepared to work your roll technique - Voodoo Dice will win you over with its addictive gameplay and countless hours of Voodoo fun! A Living World: Defeat enemies and solve enigmas in a funny and original universe with great style and vibe. There are four fascinating, 3-D worlds to explore including Jungle, Castle, Savannah, and Tropical. Endless Variety of Gameplay: play with dice attributes to solve numerous enigmas, unlock 8 new skins as you make your way through countless challenges and reach the top online ranking, interact with different parts of the environment to open your path to victory plus hundreds of possible path each time for only few solutions. Refreshing graphics: Four different worlds and atmospheres to explore and to complete, from Jungle to Castle passing by Savannah and Tropical HD support with entire 3D rendering. © 2010 Ubisoft Entertainment. All Rights Reserved. Ubisoft and the Ubisoft logo are trademarks of Ubisoft Entertainment in the U.S. and/or other countries.